Not really much going on in art class. 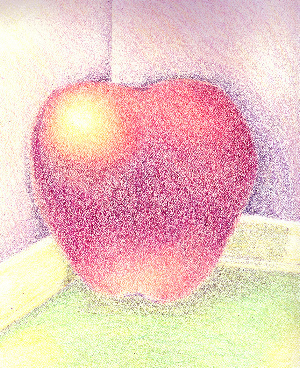 We are learning color theory and mixing, so not too many drawings except for apples, and apples and more apples. But . . I do have a few sketches, I can’t post those until I get my hands on a better camera. I thought I would post this apple because we actually got to put it in a corner. This apple has 29 layers of color and the wall, baseboard and floor has about 11 each of crayon. The technique she is teaching us is to just apply enough pressure to stain the paper as you can tell there is still enough tooth to add more layers, but I am calling this done!!! Holy smokes Girl! You are good! I like them all. Very cute drawings.